Doctors treating an American who was released earlier this week by North Korea said he suffered "severe injuries to all areas" of his brain while he was in captivity. Speaking at a press conference Thursday, Otto Warmbier's doctors said he is breathing on his own but does not consistently respond to verbal cues. Warmbier, who was in a coma when he was released, suffered "extensive loss of brain tissue in all regions of the brain," one of his doctors said. Warmbier, 22, was released by North Korea on Tuesday and arrived at the University of Cincinnati Medical Center the same day. His family was unaware of his condition until he was released. 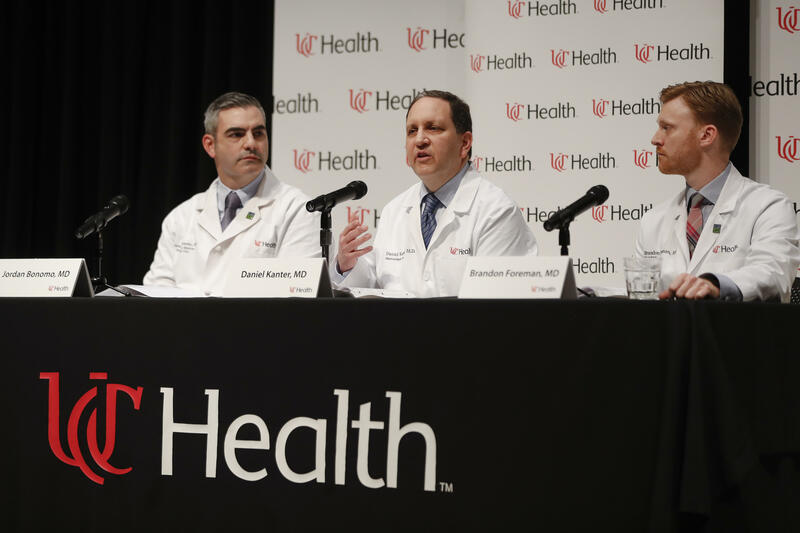 Doctors Daniel Kanter, Jordan Bonomo and Brandon Foreman briefed reporters on Warmbier's condition. The doctors would not comment on Warmbier's prognosis or his chances of fully recovering, citing his parents' wishes. They described his current condition as being in a state of "unresponsiveness wakefulness." Warmbier was sentenced to 15 years hard labor in March last year after traveling to North Korea while he was a student at the University of Virginia. He was freed this week after State Department officials traveled to North Korea and demanded his release on humanitarian grounds. North Korean authorities claimed Warmbier's coma was caused by botulism and a sleeping pill, an explanation his doctors dismissed on Thursday. They said they had found no indication of botulism, a toxin that causes nerve damage. Brain scans taken by the North Koreans in April 2016 and provided to the physicians lead them to believe Warmbier suffered his injuries in the weeks before the scans were taken. Warmbier had not been seen in public since his sentencing over a year ago. The doctors said Warmbier's brain injuries are consistent with respiratory arrest, possibly caused by intoxication or traumatic injury. Earlier Thursday, a hospital spokeswoman said Warmbier suffered a "severe neurological injury" while in North Korean custody. His father, Fred Warmbier, told reporters he believes Warmbier fell into a coma soon after being sentenced.